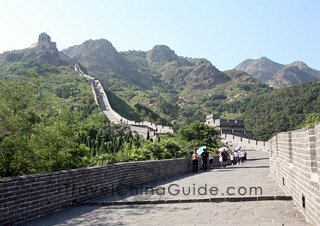 The hiking tour at Shanhaiguan Great Wall is composed of three highlights. First is the eastern starting point of the Great Wall - Old Dragon's Head (Laolongtou), second is the first pass of the wall from the east - Shanghaiguan and the last is the first mountain of the wall from the east - Jiaoshan Mountain. Along the route, one third of the wall is located within the city, one third is scenic countryside and the remaining third comprises steep mountains. It is a most suitable tour combining both sightseeing and hiking. Qinhuangdao city is accessible by flight, train, bus and ship. The airport is 13 km away from the city and offers weekly flights from Shanghai, Xian, Shenzhen, Hangzhou, Taiyuan and Shijiazhuang. The airport shuttle bus is available according to the flight schedule and costs CNY5.00 with a driving time of about 20 minutes. 1) Train D29: departs at 07:00 and arrives at 09:15, costs CNY 87.5 for a second-class seat. 2) Train D5: departs at 07:05 and arrives at 09:24, costs CNY87.5 for a second-class seat. 3) Train D21: departs at 07:13 and arrives at 09:32, costs CNY 87.5 for a second-class seat. 4) Train Y509: depart at 07:50 and arrive at 11:08, costs CNY43.5 for a hard seat and CNY66.5 for a soft seat. 5) Train T5687: departs at 10:52 and arrives at 13:48, costs CNY43.5 for a hard seat and about CNY 90 for a hard sleeper. There are also many other trains, but they are not recommended, as you will arrive in Qinhuangdao very late at night and too late to find local buses and suitable hotels. Coaches are also convenient to nearby cities like Beijing, Tianjin, Chengde, Zhenzhou, Shijiazhuang, Dalian and Shenyang. The shuttle bus between Beijing airport and Qinhuangdao runs every two hours daily. From Beijing airport, it runs from 09:30 to 21:00, and from Qinhuangdao, it runs from 05:00 to 17:00. At the Beijing Capital International Airport, you can find two stations to take this coach. One is located opposite Gate 15, on the first floor of Terminal 2. The other is located opposite Gate 3, of Terminal 3. In Qinhuangdao, the bus will stop at Qinhuangdao bus station at No.405, Beihuan Road, Haigang district. The bus fare is CNY 140 per person. 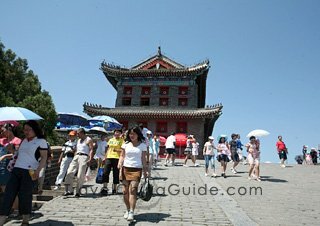 Our suggestion is a 2 - 3 day tour from the Old Dragon's Head to Shanhaiguan, then to Jiaoshan and then back. If you arrive at Qinhuangdao late in the afternoon or evening, we suggest you stay one night in the city. We do not recommend that you stay near the railway station, as the room rate there is much higher with poor facilities. There are many comfortable and clean hotels in the city. The prices vary from CNY20 per person to thousands of Yuan per night. You'd better make an early reservation, especially in the high season - June to September. If you arrive early in the morning, you may head for Old Dragon's Head in the day. Take bus No. 25 from Sidaoqiao bus station, for about 50 minutes and the ticket will only cost you CNY1 per person. Laolongtou Great Wall, located 5km (3.1 miles) south of Shanhaiguan Pass, is the eastern starting point of the Great Wall built in the Ming Dynasty (1368 - 1644), and is also the only section on the sea. The whole Wall is compared to a huge dragon winding through China, while the Laolongtou is just like the head of the dragon stretching into the Bohai Sea. That's where its name comes out. It is an important component of the military defense systems of the Great Wall, and it is also a major scenic spot of Shanhaiguan resort. The Old Dragon's Head scenic area has seven attractions, including Estuary Stone City, Jinglu Watchtower, Haishen Temple, Nanhaikou Pass, Chenghai Tower, Ninghai City and Binhai City. Among them, the Estuary Stone City was built by Qi Jiguan, a famous general of the Ming Dynasty. It is 9 meters (29.5 feet) high with half of it under water. Although it has collapsed, the existing granite cornerstone can still be seen. 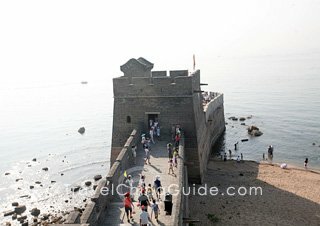 Chenghai Tower was the highest point of the Old Dragon's Head, from where you may have a perfect view of the sea. Unfortunately for us, it was destroyed in 1900. The admission fee for the Old Dragon's Head is CNY50 in high season and CNY25 in low. Two hours should be enough to stroll around this scenic area. 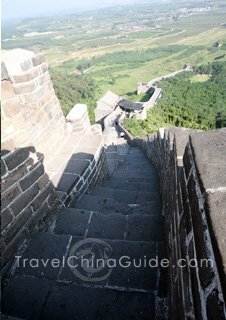 The Wall between Laolongtou and Shanhaiguan has a length of 5 kilometers (3.1 miles). On the way, you could have a good view of the sea and rural scenery. It will take you about a half day to finish this trip and on the way, you will pass the villages of Nanxiaowan, Xiaowan, Dongwaziying, Nantuzhuang, Beituzhuang and Nanyingzi. 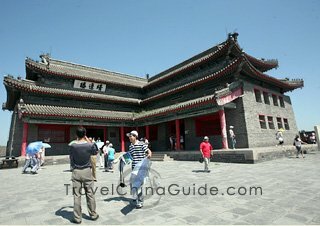 Upon arrival in Shanhaiguan, you may first check in at a hotel for one night. The room rate there is slightly higher than that of Qinhuangdao. For those who do not wish to stay there, or those who do not have interests in traveling from Laolongtou to Shanghaiguan, you may go back to Qinhuangdao and take the bus to Shanghaiguan the next morning. Shanhaiguan Pass is 17 km (10.6 miles) away from Qinhuangdao City and is easily accessible by public transport. If you prefer to take public buses, the bus No. 33 is recommended as it runs every 2 minutes and costs CNY2 per person. The bus station is located at the east side of the railway station and the transfer takes about 40 minutes. 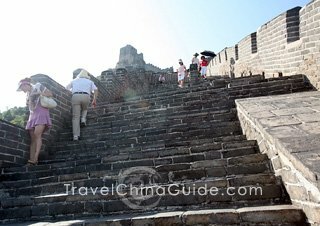 Get off the bus at Shanhaiguan south gate station and walk straight for about 10 minutes to reach the entrance of the First Pass. Or, you may get off the bus one stop later, at First Pass station, and then walk backward to the attraction. The entrance is located between two bus stops. Taxi is also a good choice as it is very cheap in Qinghuangdao City, with a flag-down price of CNY5 and a cost of about CNY35. Shanhaiguan Pass, standing 10 km (6.2 miles) east of Qinhuangdao City, is the first pass of the Great Wall of the Ming Dynasty from the northeast. Ever since it was built in the year of 1381, the Pass has become an important military stronghold in China. The small town of Shanhaiguan has a perimeter of about 4 km (2.5 miles). The Wall around it is 14 meters (45.9 feet) high and 7 meters (7.7 yards) thick. The town originally had four main city gates with a variety of ancient defense structures. With its complete defense system, Shanhaiguan Pass is known as the "First Pass under the Heaven". With its majestic watchtower as the mainstay, you can also see the surrounding architecture such as Jingbian Tower, Linlu Tower, Weiyuan Hall and Changcheng Museum. The hiking from Shanhaiguan to Jiaoshan takes about 5 hours. You can begin with the "First Pass" sightseeing area, from Jingbian Tower to Weiyuan Hall. This part takes about one hour on foot, and you will pass Muying Tower, First Pass and Linlu Tower on the way. Jingbian Tower, also named Southeast Corner Tower, was originally built in the early Ming Dynasty. It was damaged in the year of 1933 and was rebuilt in 1986. Built of bricks and wood, the two-storey tower is 13.47 meters (44.19 feet) high, looks very solemn. The First Pass under the Heaven is actually an arrow tower. It is 13 meters (42.7 feet) high, 10.1 meters (11 yards) wide from east to west and 19.7 meter (21.5 yards) long from north to south. 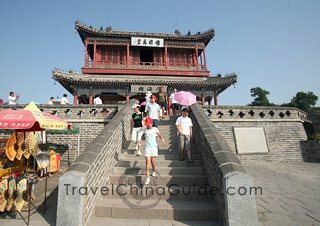 The tower also has two floors, and altogether there are three steles carved with the Chinese characters "Tian Xia Di Yi Guan", meaning the first pass under the heaven. The road from the First Pass to Weiyuan Hall has been blocked. You need to get off the Wall at the First Pass, take a bus to North Gate and climb up to the Wall again. After you get off the Wall at the First Pass, you may also spend some time at the Museum of the Wall, which is at the front square of the First Pass. Please note that the North Gate is dilapidated and you may find a thorny path as you go up. At the top of the North Gate, there is no tower that can be seen; only some stone bases are left. Walking eastward for 200 meters you will reach Weiyuan Hall. This part is covered with thorn and grass and hard to get through but keep going northward, as you will be on the way to Jiaoshan Wall. Built of green bricks and filled in with loess and gravel, the wall from Weiyuan Hall to Jiaoshan mountain gate is about three kilometers (1.9 miles). Many sections of the wall have collapsed and only some bricks are left. You will see some decadent towers along the way. This part will take you about 90 minutes on foot. Walking for about 20 minutes from Weiyuan Hall, the wall is cut off by Beihuan Road. You may get down from the wall through an alley. Walk along the highway and you will find another alley up to the wall. Keep walking northwards until you reach an iron bridge, go across the bridge and walk for about 30 minutes. You will find the Wall is cut again by the Beijing - Shenyang highway. Cross the archaic bridge over it and you will arrive at the site of Beiyi City, also called Bei Ying. You can only see some ruined walls as the city has been destroyed. After crossing an iron bridge, Bei Ying Bridge, you will then see a broken but lofty tower standing in front of you. Keep walking and you will meet the third iron bridge. At last, you will reach the Jiaoshan Scenic Spot. Starting from the Hanmen 10th Tower, the Jiaoshan Great Wall leaps and meanders along the ridge of the Jiaoshan Mountain. This section is about 1.5 km (about 1 mile) long and takes about 40 minutes on foot. The entrance fee is CNY15 per person. Hi, I'm a little confused about the hiking. 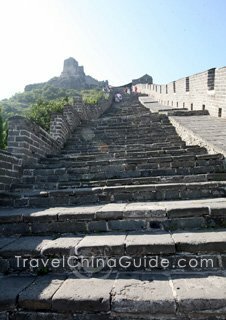 I'm wanting to start from Shanhaiguan and hike to laolongtou (where the wall meets the sea). Ideally I'd like to just do a day trip from Beijing, get a early train and then head back late at night. Is this possible? Also how do I get to my starting point, is there a bus from the train station? Also I saw that there are trains to Shanhaiguan, would it not be best to get off there than at qinhuandao? Any other advice would b helpful, thank you! 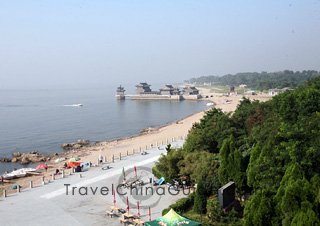 Laolongtou is located on the coast of Bohai sea, 4km south of Shanhaiguan city, Hebei province. If you arrive at Shanhaiguan railway station, you can take bus No. 25 and go through 10 stops to get off at Laolongtou station. Then walk for about 400 meters to the Laolongtou scenic area. Besides, I think time is enough if you can buy the round train tickets in a day. 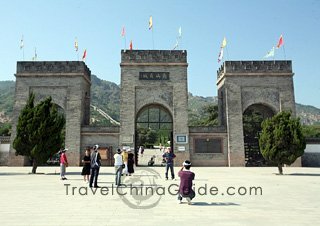 Is it possible to get a taxi or bus from Shanhaiguan to Jiaoshan? I want to see both when I am there in July. Yes, you can take a taxi from Shanhaiguan to Jiaoshan Great Wall and the fare is around CNY10-15 per cab. Thats great - thank you! 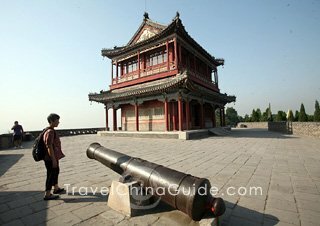 What is the best way to get to Shanhaiguan from the Cruise terminal in Tinjin? We will be arriving on 3/28/2017 and would like to make a day trip to this area on 3/29/2016- how long would this be? Is there a high speed train option? 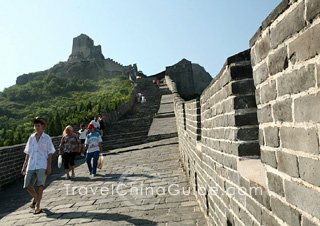 Would we have to travel from Beijing area or direct? There are high speed trains from Tianjin to Shanhaiguan directly. You can take the train from Tianjin West Railway Station or Tianjin Railway Station. The train journey takes around 1.5 hours. Hello, we are planning on going there this weekend. Would like to know if the information provided is up to date as we will use this as our guide. Please advise. Thank you. Yes, the above information is up to date and only for your reference. You are suggested to recheck the train schedule with railway station before your departure. Thank you. 3. Jinjiang Inn (Shanghaiguan Brabch): No.183-6, Old Dragon's Head Road. This one is in the urban area, but still not far from the scenic area.